You don’t see many hand-knitted sweaters from luxury brands. In general, their knitwear is sold on the quality and rarity of the fibre, rather than the manufacture. And when you do - as at Ralph Lauren Purple Label for instance - they’re very expensive. This is partly because hand knitting can’t be scaled. Many processes for clothing can be made more efficient at scale - even a lot of tailoring, outside of bespoke. But hand knitting - as in, one person sitting there with a couple of knitting needles - cannot. Yet it’s not that difficult to do. A simple sweater, in a basic design, is fairly easy to knit. Women in the family did it traditionally, of course. My wife and I still have a collection of knitted baby clothes that have been handed down through generations of her family. And today knitting it’s actually trendy. It’s something anyone can take up who wants an escape from the digital world, like craft beer, jewellery or pottery. It’s perhaps not surprising, then, that someone has set up an outfit hand-knitting bespoke sweaters. In Florence, that's Matteo Luchini. Matteo is the Tuscan agent for Albini shirtings, and has an office in Florence, just opposite the Stefano Bemer workshop on Via San Niccolo (above). It’s the family business: his father was an agent, and his grandfather before them. But his mother (below) is a knitter. She always knitted people clothes, and Matteo thought that there was a gap in the market for hand-knitted, made-to-measure knitwear. 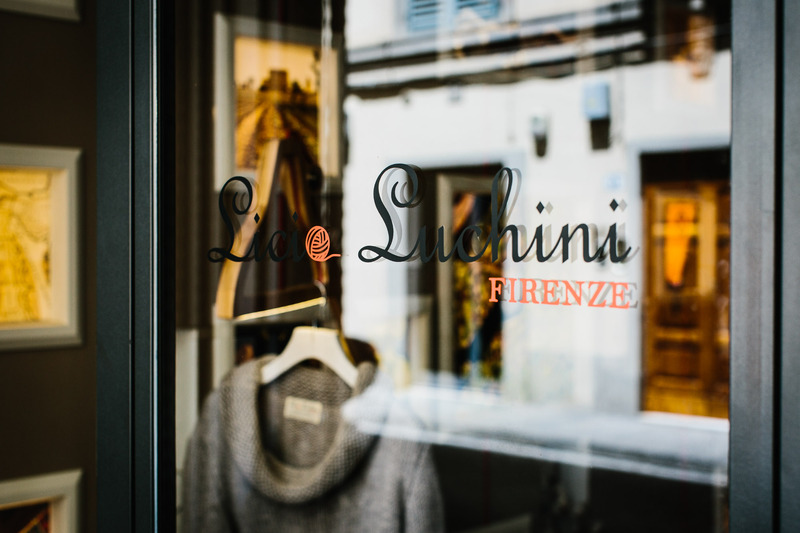 So he started a shop in the same space as the office, and named it after her: Licia Luchini. 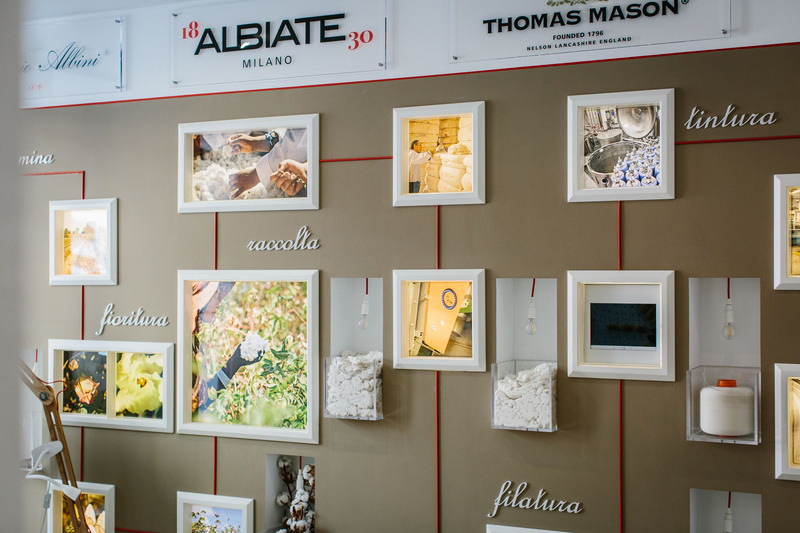 The business has only been going for a couple of years, and is run in parallel to Matteo’s agency work. His assistants, Lisa and Alessia (left and right respectively) are pictured below. The plan is to offer knitwear only to a customer’s measurements, in any design and any yarn. There is shetland, merino, cashmere and cashmere/silk, with the cashmere coming from Zegna Baruffa. Delivery is 4-6 weeks, with prices ranging from €450 to €900 depending on the fibre and complication of the design. “Hand knitting has a lovely natural stretch that comes from the loose way it is woven,” says Matteo. "This cannot be replicated on an automated loom, both because the loom would have to run too slowly, and because it cannot use the thickest yarns." Hand knitting, by contrast, needs thick yarn, which is why those hand-me-downs are always so chunky. 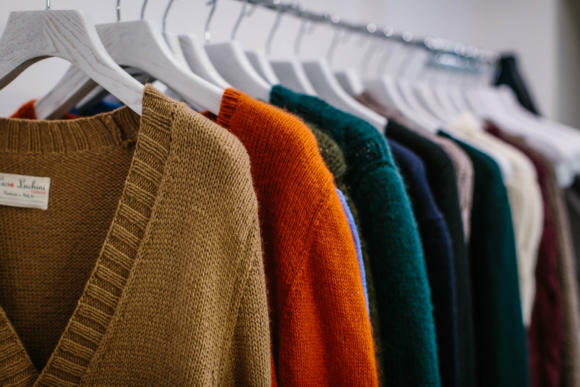 Less obvious, but perhaps more attractive, is small variations in the body of the sweater: ever-so-slightly thicker or thinner loops that you only pick up on close inspection. Licia is often in the shop knitting, keeping Matteo company. And she has a big store of old pattern books. 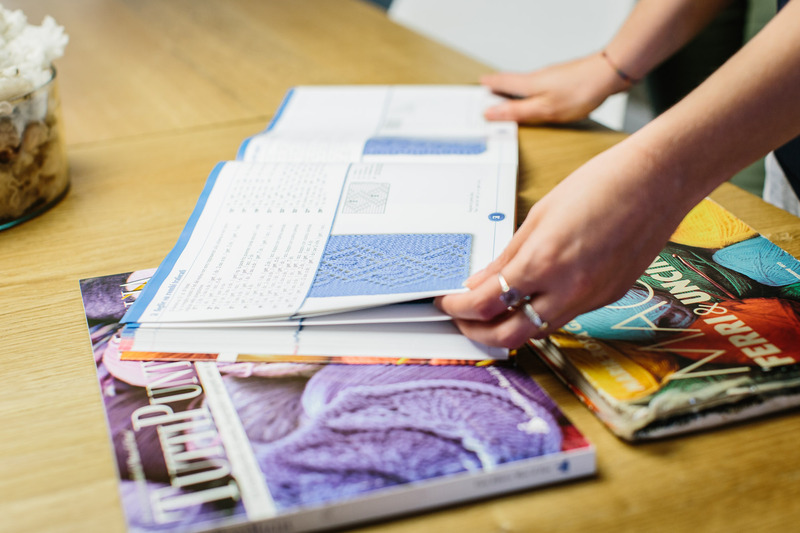 Looking through these books, at all the intricate designs and figurations, you realise quite how much is possible with hand knitting. There are so many patterns and permutations. Which of course is where traditional fishermen’s sweaters come from, with the various islands or towns creating their own local pattern. I don't think most of these patterns will be suited to menswear, though. A classic Fairisle sweater is one thing, but an intricate floral design on the chest of a crewneck might look rather odd. I also worry slightly about Matteo creating pieces from scratch based on measurements. In my experience it’s hard enough to specify the fit of a sweater when you have samples to try on. I’ve done that at Loro Piana, Simone Abbarchi, Saman Amel and others - and it’s not straightforward, particularly the first time. Even harder will be creating a piece from scratch, with the fitter having to make their own assumptions about design and tolerances. I don't want to pre-judge anything however, and it's a new business that will certainly evolve. I ordered a navy cashmere crewneck to try out and review, with an extremely subtle 'peacock' design on the top of each sleeve, to see how that looks. It cost €850. I’ll report back in the New Year. You can follow the discussion on Licia Luchini: Bespoke knitwear, Florence by entering your email address in the box below. You will then receive an email every time a new comment is added. These will also contain a link to a page where you can stop the alerts, and remove all of your related data from the site. So is it bespoke or made to measure? Not sure there’s a market for their product. There are so many knitwear producers that it’s impossible not to find what you’re looking for at a reasonable price. It’s a sad day when one has to resort to luxury brands to purchase something that should be made by one’s grandmother. May I also register my opposition to the modern sartorialists’ obsession with fit when it comes to knitwear. The whole essence of the design, and the beauty, of knitwear is the flexible fit. Baggy, strethy things that will fit most body types. That’s why we call them “chunky sweaters”. I’ve said it before: the male aesthetic is in crisis. And no one seems to want to do anything about it. Quite the contrary. Personally I find a lot of people who go for MTM knitwear definitely go too skinny. They don’t appreciate the dynamics of a sweater, how much you need in the length or width. But at the same time, I do think it’s a lot more flattering when knitwear fits well. Fortunately (for me) most brands are now slimmer than the old, very boxy fits, and I don’t necessarily need MTM. For some of us we need fine (not chunky) knitwear that literally fits. As in the arms are not 5inches too short. Or the arms fit lenghtwise but it is so baggy that i cant put outerwear over it to stop wind and rain. Saman amel seems promising! The chunky stuff is easily available from my mother when she is getting bored… Were I to order from the lady knitting above I would be cast out I suspect. What are you going on about Bobs? One glance at this year’s mens A/W shows captures oversized sweaters galore. None of them would look good worn with tailoring and certainly not in the office when one removes his jacket. That is, neither are “modern sartorialists” overlooking oversized sweaters nor should all sweaters be oversized. No, it’s not “impossible” not to find what you’re looking for. I searched everywhere, and there is nothing RTW that fits. Everything has too short sleeves. Picking up on Hannes point and maybe a little off topic . On a boring , grey Wednesday I decided to amuse myself so I’ve just rung afew local Tailors (randomly off a quick google search ) and enquired “do you do MTM or Bespoke ?”. Not a single one could give me a straight forward answer. One sounded defensive , another condescending etc . At the end of this small exercise I got the measure of them but they certainly won’t get to measure me ! I’m afraid this is what happens to PS reducated readers . What do you feel that differentiates these guys from all the others selling bespoke/knitted to order jumpers other than their link to the bespoke trade? I have had a couple done in the past, sometimes supplying the wool as it was cheaper to buy a cone than the knitter said the balls would cost and others not, but at the time they worked out at around £80-£120 for the effort and circa £50 for materials. Fit was ok, better than RTW but I am not a standard size, but not overly keen on the chunkier fabric. Did one knitting machine one too that was about the same for fabric but cheaper labour but the quality wasnt great. The wool was mainly from Knoll Yarn who were exceptionally helpful and I was very surprised that they were happy to send loads of samples, field my nieve questions etc when I was up front and said that I’d be only buying a few cones – they even adjusted their P&P prices from the normal floor. I don’t have the exact prices to hand but a cone (1kg) was typically about 25% the price of buying the equivalent weight in balls of wool (and we are talking identical Donegal Yarns rather than just similar). Some do arrive oily/”in oil” and so require washing that loses 5-10% of the weight. Would be a faff if you were doing it commercially without the right kit but for just doing a few items to wash it and turn it into a skein was kind of fun. The couple of people I spoke to, including the ones I commissioned, are basically the grannies Bobby mentioned who are doing it as a sideline/in front of the telly etc and so were happy working at relatively low rates – no negotiating them down from me. The ones I did have done were done well but I was picky with asking questions and went based on who could at least talk the talk rather than price. Absolutely. THIS is the kind of business model that we should encourage. I know some upmarket women’s fashion brands in London that employ an army of grannies in places like Greece and Cyprus to do their embroidery. The labour costs are cheaper than the UK, ancient skills are being kept alive, and people in Europe’s peripheral regions are kept in employment. Ditto for the Hungarian and Romanian cottage industry producing hand-sewn gloves for some venerable names back in the UK. Or Calabrian grannies making superb grenadine ties, or handrolling the tightest edges on pocket squares, for houses in Paris and Milan. We need more of this sort of things, I say. Thank you, Simon. Any idea of whether she would be able to knit chunky cardigan such as the shawl collar one from William Lockie? I’m desperate to find one in my size and would not mind using the MTM route but I do not know whether the ribbed chunky cardigan is an option with them. I’ve always wondered if it is possible to make alterations to a hand-knitted garment. What happens if the sweater doesnt fit right? Or if the sleeve is a bit too long? Do they have to make an entirely new sweater? Do they charge extra for that? Or how do they guarantee the fit? It’s actually easier to make changes to a hand-knitted garment. I can’t remember exactly what’s possible, but you can for example take off the ribbing of the body and just knit more onto it, before adding the ribbing back on. Much harder to do on a machine-knitted sweater. Knitwear is never going to be as easy to alter as tailoring, however. So if the fit isn’t good enough you would end up having another made (as I did with my first Saman Amel for example). My dear mother knitted many sweaters for me over the years. My cricket sweater was the envy of the whole school for that reason. I can’t remember much about,and therefore comment on, the fit, but I do remember how nice it felt to be wearing something so unique and personal. Father led me to bespoke during my teens and that, as they say, was that. Consider me less ignorant now. There are several companies selling hand-knitted knitwear, though not always MTM. A number seem to specialize in fair-isle patterns. 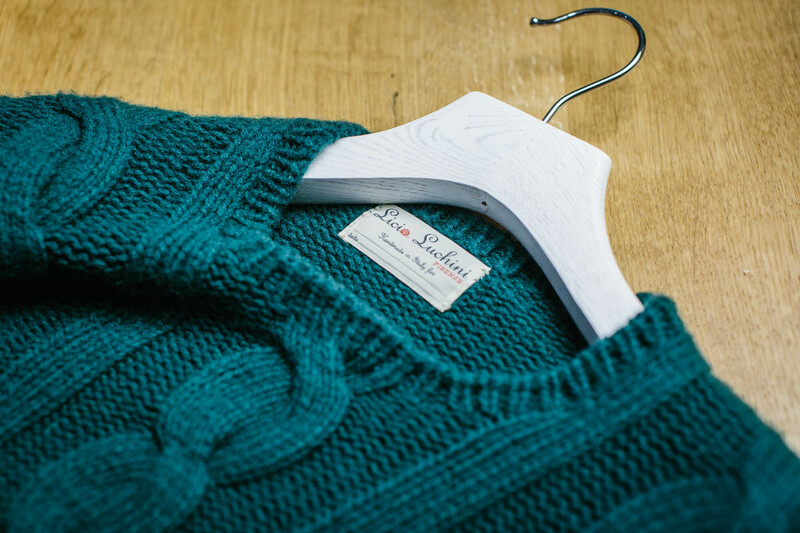 Anderson&Co (https://www.shetlandknitwear.com/) is one such, the Shetland Collection (http://shetland-knitwear.co.uk/) is another. Simon and others, where can one purchase MTM knitwear? Does not need to be hand knit. Flamborough Marine, as featured on Die Workwear, are good on fit though limited in design. On the whole I rely on my wife and mother in law for knitwear. A word of caution, it will not always work out cheaper and as in all bespoke, it takes a great deal of skill and a few attempts to get the fit right. Would you wear an orange sweater like the one pictured hanging on a rack? N Peal will produce jumpers that are based on adjusted measures at no extra charge. Of course, you’re limited to cashmere. Over a year ago I wrote to you about a knitting shop in Brighton called Laine (I have no connection) wherein bespoke knitting garments can be made (for much less than the price of your commission!). They can produce in a wide range of colours and wool types (incl. cashmere etc.). Moreover they have some vintage machines that are utilised for wool garment alterations. 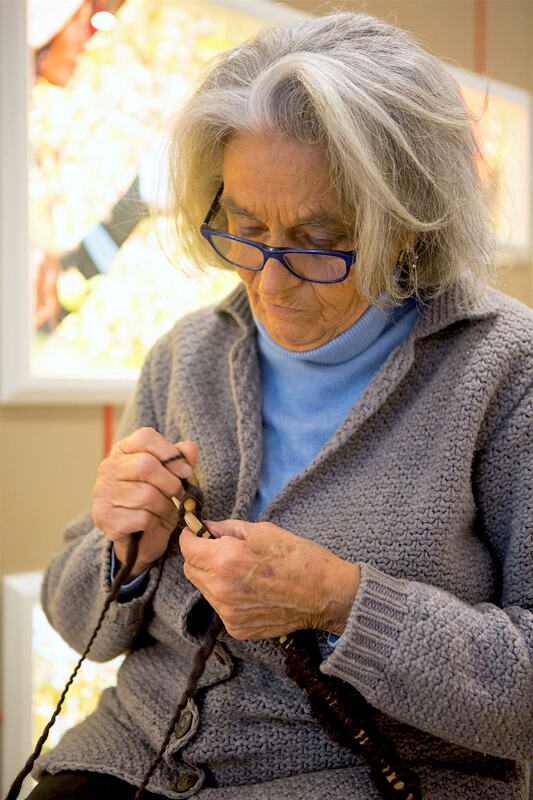 Grannies Inc. also offer a hand knitting service in London. Moreover there has been a re-birth of knitting stores in the UK. Yak, Hoop Haberdashery etc. Some of which offer a hand knitting service through their links to knitters/knitting groups. So….with this on your front door step why, yet again, ignore the UK and highlight something in Italy? And yes it does matter where things are if there is no trunk show or you don’t wish to travel. By all means promote Licia, but where is the balance and why no support for UK-based, small, self owned, enterprising, craft businesses such as those mentioned? Oh dear, you do jump to extremes. I write about a huge number of British producers and artisans, and now because I’ve covered one knitter in Italy I’m suddenly ignoring and not supporting British craft? So Simon, here’s a challenge for you. 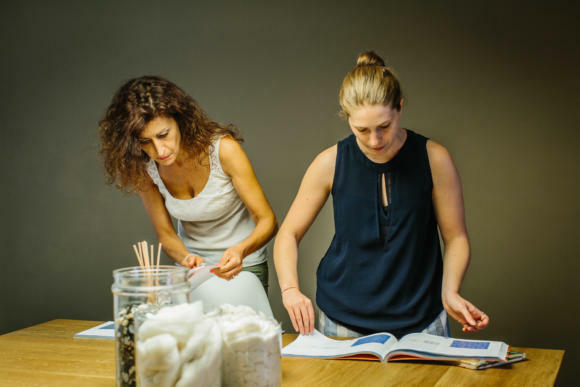 How do you manage to know about this obscure local business somewhere in Italy and not about the many UK based knitters highlighted in the Anonymous post? Obviously not something you have “stumbled” across by chance clearly. Come on, do tell what it is that motivates this type of review? Let’s try to be polite, Martin? Thanks. I am aware of many of those UK knitters. But most of them do not fit with the Permanent Style aesthetic or the level of quality we normally discuss. Some of them are not making classic menswear really, and most aren’t appealing to a luxury market – and aren’t using the very top of cashmere, for example, as a result. I met Matteo because he has a shop across the road from Stefano Bemer, where I often am. He’s lovely, the family’s lovely, and the product is very good. That’s what motivates me. And I do hope you’re not suggesting that this coverage is in any way paid for. I don’t take, have never taken, and will never take money for coverage. Despite the fact that 99% of the industry works this way, and I have to begin every meeting with a new brand or maker explaining for 10 minutes that I don’t want their money. That I don’t want to ‘collaborate’. Then I have to explain again for 10 minutes, because they don’t believe me. Sorry, not meant to be impolite at all, and no inference that you are being paid for these pieces. It’s more about the inconsistency of your arguments Simon. In the past you have said that you don’t review the many (excellent) bespoke uk based tailors who don’t travel to London as, being in the provinces, are therefore inaccessible to so many of your readers. This despite many of your commentators saying they match or beat anything from the Row at much lower prices. And yet you write a whole story about a hand-knitter in Italy who doesn’t come to London whilst, by your own admission, not writing anything about London based knitters, who you claim to know about, because they don’t fit the PS “aesthetic” (whatever that is). My own view is that this places a bit of a challenge on your credibility; contradicting yourself is not going to enhance your reputation. I think your memory is a little partial though. One of the reasons I don’t cover tailors around the UK is access. Another is that they are pretty much all derivatives of the Row, the only differentiating factor being price. That’s a reason I’m more likely to cover a regional Italian tailor, or indeed another from around Europe if they do something different. 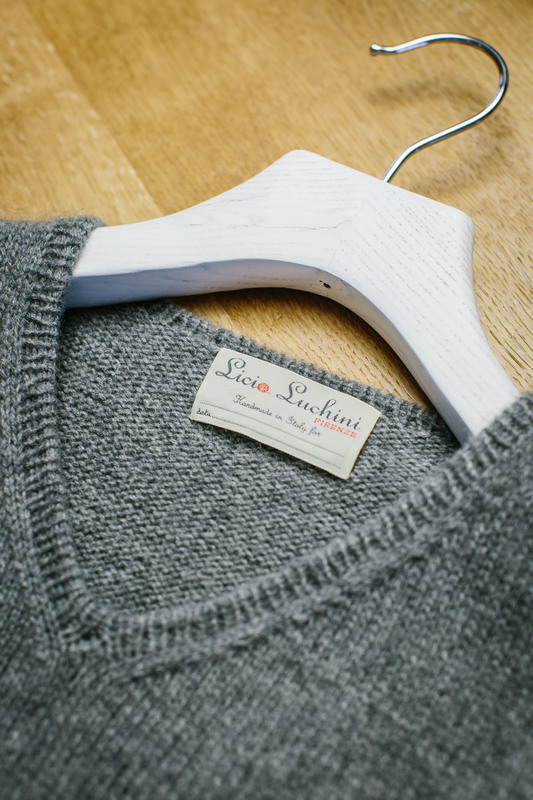 Licia Luchini are doing something different. The suggestions above of Shetland knitters is great. I didn’t know those and I’ll look to cover them if I can. But if you think Grannies Inc is the kind of thing we cover on Permanent Style then you might have the wrong website. Are you suggesting you haven’t secretly lusted after a lime green sweater emblazoned with your favourite Disney character? It never fails to amaze me that these sort of comments are always posted by some Anon. Looking forward to the test product report! Picking up on Robins point of MTM v bespoke. Personally i think its a nightmare and so confusing. More and more the lines blue between the 2. Ive seen what would be classed as MTM with a fitting called bespoke. Ive also hard of what would be classed as bespoke done off block patterns. It so tricky to define. For me the best way it to know what you want out of it, and to ask those questions. Understand what bespoke means to you and ask the questions pertinant to what you want. Interesting point ,Scott but I think the distinction is simple but ‘tailors’ like to cloud it. 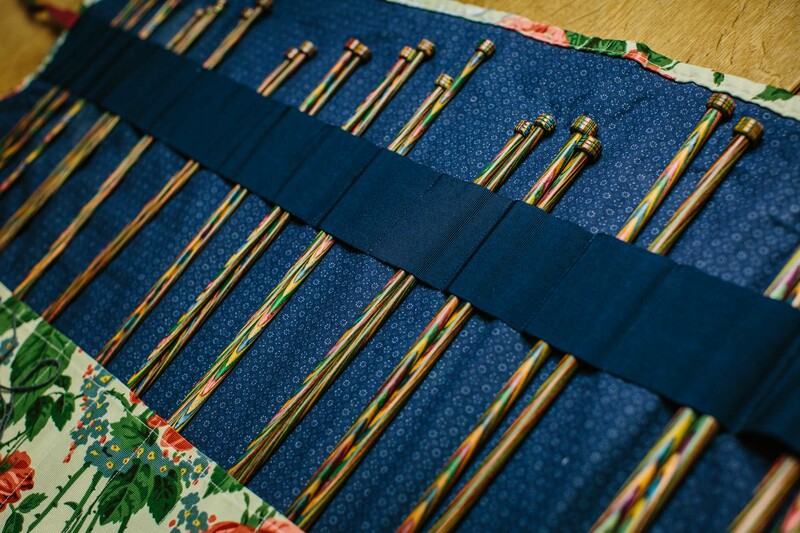 Bespoke – your unique pattern is made from many measurements taken from your body. MTM – a standard pattern is used and adjusted based on a few of your measurements. Essentially whether it is bespoke or MTM for me starts with from what the cloth will be cut ….your pattern (bespoke) or a standard pattern (MTM) . As to how it’s made (handwork / machine work) for me does not mean bespoke or MTM . Although a classic way of seeing if you’re misled is asking how many fittings their will be and if there will be a ‘baste fitting’. P.S. I have nothing against MTM I just wish ‘tailors’ would come clean. My experience is that not all tailors like to cloud it. But that not all clients understand the difference…..and I would say a lot don’t really care (shame). One day (hopefully) everyone will understand the difference between the 2 and everyone can be clear. However I don’t think that will ever happen. It’ll be passionate guys who read PS that understand and will likely be the only ones. As I say, ask questions and know what you want….it’s the best way. Again, I know of bespoke done without any baste or fittings. But it’s still bespoke. Levi’s bespoke jeans don’t usually offer a fitting…..but they are absolutely bespoke. I am so pleased you have met Licia and Matteo and their colleagues and featured their painstaking work. I am even more pleased that you have highlighted the fact that handknitting cannot be scaled up – thank you so much for mentioning that. As a British designer and maker of handknitted men’s accessories, in particular knitted ties, I frequently have conversations about how long the designs take to make. A tie can take several days and an intricate scarf of the type I make can take several weeks. I only use wool that is dyed by hand so I add in an additional layer of ‘slow making’ in order to achieve the effects and finishes that I am looking for. 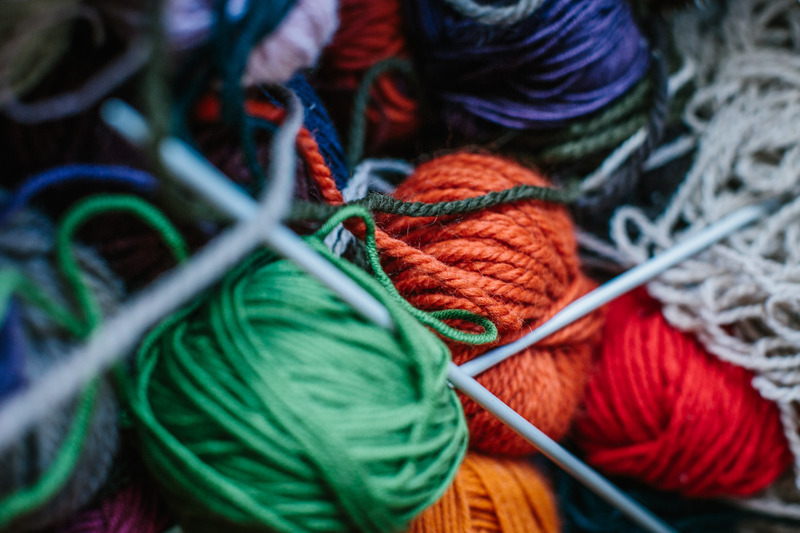 In a world where the majority of knitted items are machine made, talking to buyers and customers from my perspective as a handknitting designer is a fascinating process trying to explain the similarities and differences. In many ways the two production methods are entirely different, sharing only the looped construction of the stitches. I believe that we can like both types of garment or accessory, but recognise that they have inherent differences: one can be a bespoke, collectible or limited edition, and the other a useful yet equally elegant item of clothing. One of the most pleasurable aspects of my work is the conversations I find myself having with my customers, about the provenance of the colours, the work of the artisan dyers whose wool I use, the shades men would like to incorporate into their wardrobes, and the dimensions of the items they hope for – as well as being able to show them stock designs I have already made because the colours intrigued me. I wish Licia, Matteo and their fellow knitters great fortune and hope they enjoy what they do as much as I enjoy making my pieces. Why don’t these constant naysayers stay off your posts Simon or why do you continue to post their pointless views. I’m not sure why they don’t stay off, it does seem a little silly. I try to be as open as possible, as there are often interesting points buried in there… But starting to regret this one. Simon, I do not wish you to feel under attack every time you do something slightly different. However I think there needs to be some honesty about your approach: it is simple, you love Italian products and, in general, the Italian aesthetic. That’s not to say you don’t appreciate other products but, generally, they fit with your sensibilities. Long term fans of PS see this. Problems arise however when espousing an open approach then consistently focusing on Italy. There is of course the lateral element of reflecting onto PS the afterglow of the Italian based high-end luxe industry. Of the last 58 posts there are 10 true commissions (external to PS and it’s combined offerings) 7 of which are Italian. So that’s 70%, no one is jumping to extremes…. I don’t think you’re right though – it’s much more subtle and varied. Right now, I tend to prefer Italian tailoring in jackets, but usually made in English cloths. Tweeds and flannels. The knitwear I like and write about is mostly British – shetlands from A&S, shawls from Drake’s, but with the occasional Italian cashmere. Most of my trousers are made by Whitcomb & Shaftesbury, an English make but made in India. Shirts from Luca or 100 Hands, so Italy or India. Casual wear is all English or Japanese. You’d have to take a pretty narrow view to say I just focus on Italy. About publishing negative comments: Blogs, as with all media, require an audience. If the audience is passionate it will challenge views or positions it disagrees with. Readers who seek bespoke garments have, amongst other things, educated themselves about clothing (and continue to do so). It is easy to post comments that agree or serve the editorial, however many also read the comments section for the often intelligent range of views that give an alternate point. I have learnt much through the experience of others. This can be switched off but as some news outlets have found reader numbers then drop. Readers/users drive revenue from Facebook to the smallest online retailer. Simon is selling advertising to finance PS he therefore needs reader numbers of suitable volume. At the heart of this is the capture of a bespoke market and its data base. Which also raises questions about monetisation and use of reader data (the current competition that requires entry via an e-mail/contacts trawl is an example). As for names: Terry, June, Barbara, Tom, Anonymous; it makes no difference as the name used could be just a nom-de-plum. John Smith of Norwich probably means little to someone in NY who has their own life to concern himself/herself with. As a man of smaller stature, knitwear can be a nightmare. The it’s either uncomfortably full in the body, the sleeves too long, or the neck too small. It’s a bit like the exposure triangle in photography. Although the length could be a fourth dimension that can be off. However unique my proportions, I have been able to find a few models from a couple brands that can work. But there is still unnecessary fullness in the body that make it just uncomfortable under a jacket. So I prefer artisan items for practical purposes and for the perceived conscientious approach to consumerism inherent to MTO, MTM, and bespoke. With that being said, do Licia Luchini offer sales of their MTM/bespoke over the internet? A quick look at their site showed RTW and what appeared to be MTO (with sizing XS-XXXL). I would be interested in one of their knit hoodies. Looking forward to the review of their results.